With Columbus Day just around the corner, why not celebrate with a discounted TouchyBook? The Journey of Christopher Columbus is currently 50% off and will be sure to delight any child with a fun-filled quick history lesson. 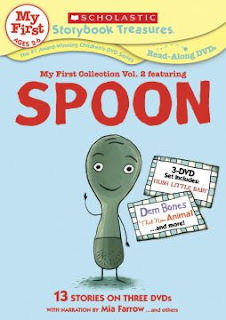 As a teacher, I was happy to see that the book was historically accurate, and as a mom to 2 preschoolers I was happy to see it was geared towards little kids. 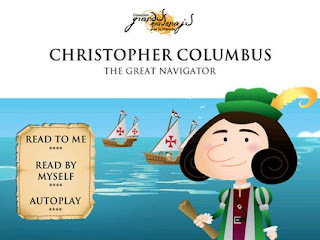 TouchyBooks made Christopher Columbus come to life with cute graphics and a simple storyline. The book's wording works well in that they made Columbus talk about himself in the past tense as he explained to kids today what people believed about the world when he was around. He explains that they thought the only continents were Europe and Asia ("The Indies"). The interactive features included were a few simple touch-and-move features per page, but there were also two new puzzle games that the kids really liked. So if you are a TouchyBooks fan like me (and if you are not-you don't know what you are missing), pick up The Journey of Christopher Columbus today for 50% off.